Solar Science: What's the Difference Between Solar Flares and Coronal Mass Ejections (CMEs)? St. Mary’s Astronomy Research Team Specialist or SMARTS is a high school astronomy club in Medford, Oregon. Every year the club participates in a project such as double star observations, Lunar and Planetary Institute’s High School research program, or NITARP (NASA/IPAC teacher Archive Research Program). While talking to a team member from our NITARP project one of our club members learned about the Radio Jove project. We did some research and decided to build a receiver and antenna for the 2013-2014 school year. Four students took charge of building the receiver, but everyone celebrated at the end of the year club party with the successful initial run and data collection of our telescope. Building the receiver was extremely educational. We were glad the Radio Jove group had members that could fix our two mistakes on the circuit board. Meeting Chuck Higgins at the American Astronomical Society (AAS) conference in Washington, DC put a face to the project. It was fun to be involved in the teleconferences. Since our telescope had yet to be built during the Jupiter season, having the opportunity to listen to the noise picked up by other telescopes and have someone explain what we were seeing and hearing was great! We learned a lot on those occasions. 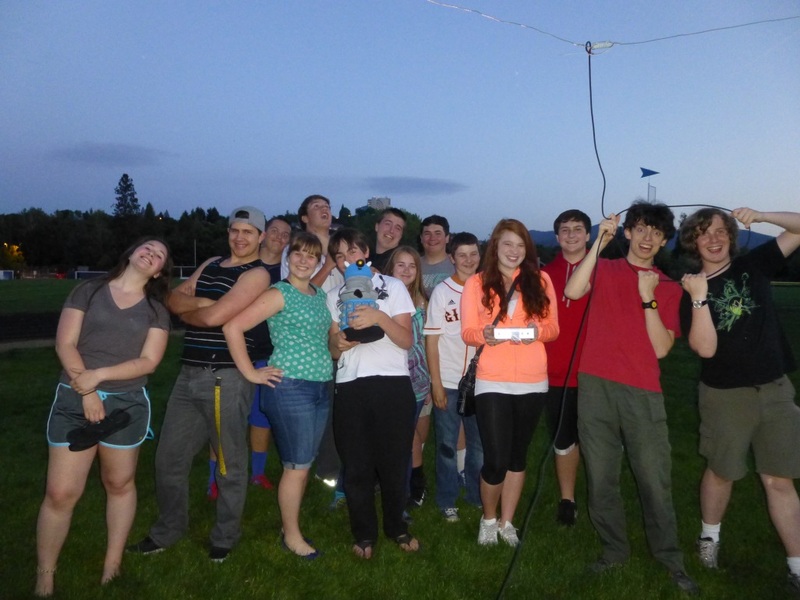 St. Mary’s High School Astronomy Club celebrating the successful completion of our Radio Jove receiver system. In July one of my students and I took the Radio Jove telescope to Pine Mountain Observatory for a 5 day high school research workshop. This was the first time a radio telescope made an appearance at the workshop. It was a successful week for us. We could run it when it was cloudy, when the sun was out, and when it was raining. The individuals with the optical telescopes fought the weather. David Haworth was there to lend some much needed advice on reading the squiggly lines and confirming our results with other, reliable sources. One of the other high school teachers from the workshop is seriously thinking about building a Radio Jove telescope after seeing our telescope in action. Emry Timmons and our Radio Jove telescope set up at Pine Mountain Observatory near Bend, Oregon. Our next step is to collect more data and perhaps catch some Jupiter/Io storms this year. In December 2013, Dave Typinski recorded a nighttime spectrogram with some ghostly sweeping features. Discussion with the Radio Jove Spectrograph Users Group (SUG) suggested that these features might be the result of a geomagnetic disturbance. In October 2014, Typinski noticed similar features appearing again in his spectrograms. There were more discussions within the SUG of these “weird nighttime events” or WNEs. Thomas Ashcraft and Wes Greenman also started noticing them in their spectrograms. We all scratched our heads. While the sun was rather active there were no coronal mass ejection (CME) impacts on earth. “What are these things?” we all wondered. Ashcraft suggested that maybe we were seeing Cassiopeia A (Cas A) or Cygnus A scintillation. He had noted the similarity of the WNEs to scintillation events observed by the KAIRA research instrument in Finland. Dr. Francisco Reyes suggested that Typinski’s 8-element array be steered north toward Cas A, when this was done on October 30 the sweeping features appeared much stronger. The mystery was solved: the WNEs were really Cas A scintillation. Figure 1 – Cas A scintillation observed by Dave Typinski on 30 Oct 2014 with an 8-element TFD array, the dual polarization radio spectrograph (DPS), and two Jove receivers. The antenna beam was steered to 0° azimuth and 60° elevation. Cas A transited at 0221 UTC. 20 MHz HPBW is 15° EW and 35° NS, gain for emissions with random polarization (such as Cas A) is approximately 14 dBi. 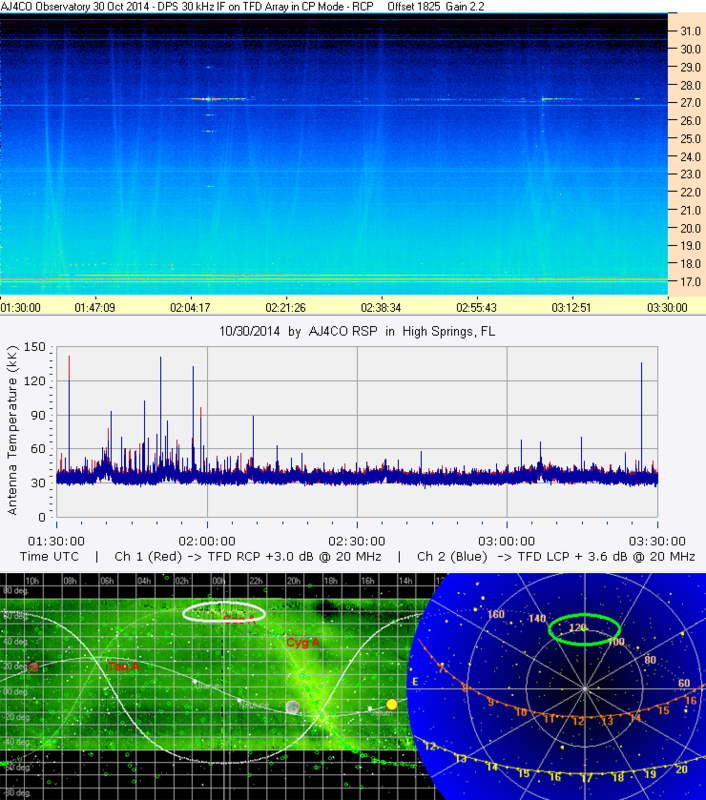 Figure 2 – Cas A scintillation observed by Thomas Ashcraft on 07 Nov 2014 with a Radio Jove dual dipole array and the FSX-4 radio spectrograph. Beam was steered to zenith and the array gain is about 8 dBi. Cassiopeia A is a supernova remnant roughly 11,000 light years away. It is the strongest radio source outside our solar system, with a 20 MHz flux density of 65,000 Janskys, similar in strength to weak Jovian emission. We can just barely see it with a spectrograph and a Jove antenna because of propagation effects which cause the signal to vary in amplitude (scintillate). Even with Typinski’s 8-element array and a Jove receiver the fluctuations were barely visible in SkyPipe above the galactic background during the Oct 30 observation (Figure 1). Stars twinkle because of turbulence in the earth’s atmosphere. This turbulence causes changes in the refractive index along the light’s propagation path. Point radio sources scintillate for the same reason. Much of this effect occurs in the earth’s ionosphere. Drifting clumps of electrons within the ionosphere can act like lenses, briefly focusing energy on our radio telescope antenna. This is what causes the nearly vertical ghostly streaks in our spectrograms. These streaks are not perfectly vertical because ionospheric effects are frequency dependent – at any given time, a good ionospheric lens for Cas A at one frequency may not be so good at another frequency. A disturbed ionosphere can cause the observed scintillation. High solar activity or a CME impact will stir up the ionosphere. However, sometimes when the Sun is active, Cas A scintillation is not observed. The fine structure and variability of the ionosphere with solar activity is very much a field of current research. Cas A scintillation is one probe of the ionosphere’s dynamics. IEEE Young Professionals Southern Alberta Section (SAS) with their STAR (Students, Teachers and Researchers) initiative in collaboration with Astronomy Teacher Training Institute (ATTI) are bringing greater awareness of Radio and Microwave technology to students in Alberta. ATTI is a non-profit organization founded by Mr. Tushar Sharma (Chairperson IEEE Young Professionals SAS) with an aim of popularizing science among high school students. Through this initiative the Society of Amateur Radio Astronomers (SARA) awarded a grant to the University of Calgary students in the form of a Radio Jove kit. Upon receiving this kit, two of the university students from the Electrical and Computer Engineering department, Mr. Dhruv Rijo (2nd year undergraduate) and Ms. Sara Awara (3rd year undergraduate), assembled the receiver and simulated the antenna for performance optimization under the guidance of Mr. Sharma and Mr. Anis Arfi, a second year graduate student at the iRadio laboratories, University of Calgary, Canada. The team is looking into whether they can optimize the Radio Jove antenna They have focused their efforts on studying different antennas in a search for a smaller antenna that will yield suitable results. 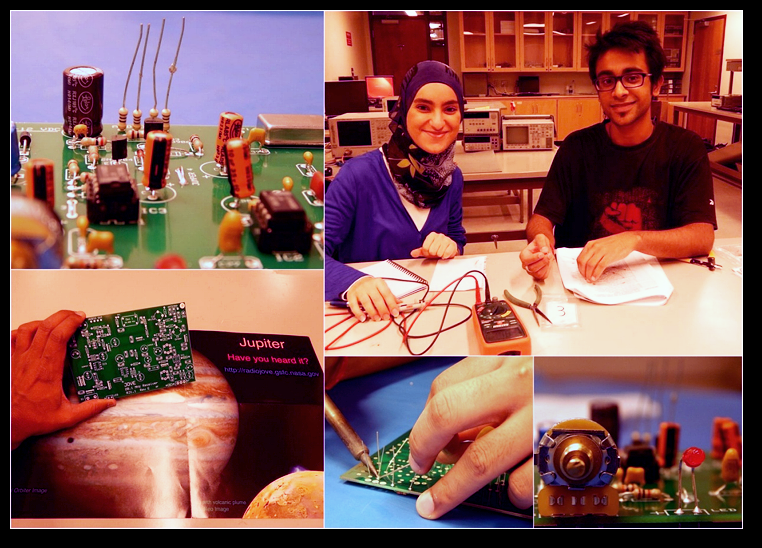 With the help of Mr. Sharma and Mr. Arfi they learned soldering techniques and successfully built the Jove receiver kit. After soldering the receiver, next was the testing stage during which they looked into areas of potential improvement. Using the 'Numerical Electromagnetics Code’ (NEC2) software, the team of four simulated the electromagnetic response of different types of antennas like dipole, loop, helix etc. for their project specifications. All the antennas were optimized for 20.1 MHz frequency, the frequency used by the Radio Jove program. Currently, they are working on a comparative study for the loop design and observing the effects of varying different parameters of the design, such as the height of the loop above the ground, radii of the coupling loop and outer loop, capacitance used for tuning, types of material used, etc. Believing that every possible change will have an effect on the antenna performance, their aim is to document as many of these effects as possible and relate them to the antenna performance to obtain an optimized design. Furthermore the group will make simultaneous observations of Jupiter with the real Jove dual dipole antenna and the optimized loop to check on the validity of the loop model. Results will be published in a future Jove Bulletin. The team hopes to build a continuing education center at Siksika, Alberta. As a part of this project they plan to provide hands-on training in astronomy including optical and radio telescope building and antenna design. Their planned teaching method would include using story-telling to impart knowledge. The Young Professionals hope to include a wide segment of the population so that the next generation can be made more aware of the wonders of science. We would like to thank SARA, Mr. Bruce Rout, Dr. James Thieman, Dr Deborah Scherrer, Professor Fadhel Gahnnouchi and Dr. Ramzi Darraji for their help and guidance throughout this motivational journey!! A radio spectrogram displays signal strength (as different colors) on the frequency-time plane. Usually the colors are chosen so that blue is weak and red is strong. The images below are generated by a special receiver, which steps rapidly thru hundreds of frequencies – dwelling briefly at each frequency and measuring signal strength. The horizontal axis is universal time and the vertical axis is frequency in MHz. Several Jove stations stream spectrograph data in real time over the internet which can be viewed with Jim Sky’s free software available at http://jupiter.wcc.hawaii.edu/spectrograph_software.htm Observers using a Jove receiver can benefit from viewing these real time spectrograms as an aid to seeing what is happening at their observing frequency as well as other frequencies. Figure 1. This 24 hour spectrogram shows both nighttime (03 -12 UTC) and daytime conditions. The dark blue of quiet nighttime listening conditions gives way to band noise and terrestrial stations seen as horizontal lines seen from (12 -24UTC). Lots of CB stations around 27 MHz and WWV is visible during the daytime at 20 MHz. Figure 2. A very strong solar burst lights up the spectrogram. Some solar bursts are short – lasting only tens of seconds. At other times activity can continue for tens of minutes or longer. The bursts often drift from high to low frequency as radiating electrons are ejected upward from the sun. Figure 3. Sometimes a strong X-ray flare causes the earth’s ionosphere to become very absorptive. 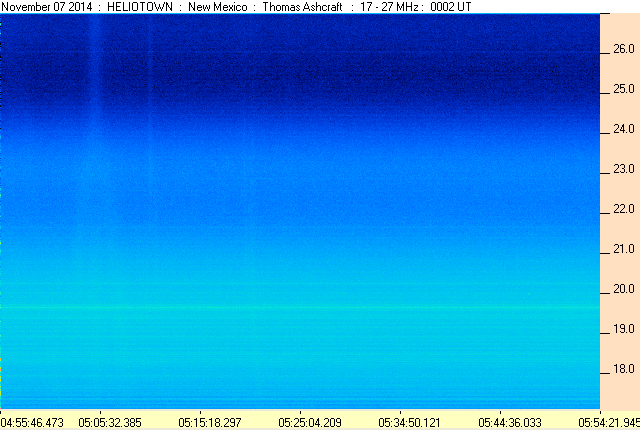 Here we see that the terrestrial stations visible before the flare disappear in the radio blackout which follows. Many X-ray flares are not accompanied by a radio noise burst, so we simply see the terrestrial stations disappear. It often takes the ionosphere several minutes to recover, after which time the terrestrial stations reappear. Figure 4. Jupiter radio noise emissions are described most often as L (long) or S (short) bursts. On rare occasions both types are visible on a single spectrogram. The L-bursts often appear as amorphous blobs while the S-bursts are seen as short vertical streaks occurring at rates of several bursts per second. During this storm an observer using a Jove receiver at 20.1 MHz would have picked up S-bursts, but not the L-bursts occurring above 22 MHz, between 02:50 and 02:51UTC. Figure 5. When Jovian bursts are observed with a linearly polarized antenna we often see Faraday bands – these maxima and minima at different frequencies are due to the polarization of the received signal rotating as it passes thru the earth’s ionosphere and magnetic field. Figure 6. Jovian bursts are often seen with tilted features called modulation lanes. Figure 7. A nearby lightning storm produces strong vertical bands. On a Jove receiver lightning produces strong sharp cracking sounds. It’s a good practice to disconnect your Jove antenna if there is the chance of local lightning. The diagonal line starting around 06:25:16 is an ionospheric probe – sweeping from low to high frequency. Figure 8. Power Line Arcing – The diagonal bands are courtesy of a local power company. The slope of the lines results from arcing on the power lines which occurs 120 times per second beating with the sweep frequency of the receiver (10 sweeps per second). This interference often makes observations of celestial sources impossible. The Astronomical League in cooperation with the National Radio Astronomy Observatory has established a new observing program for radio astronomy. 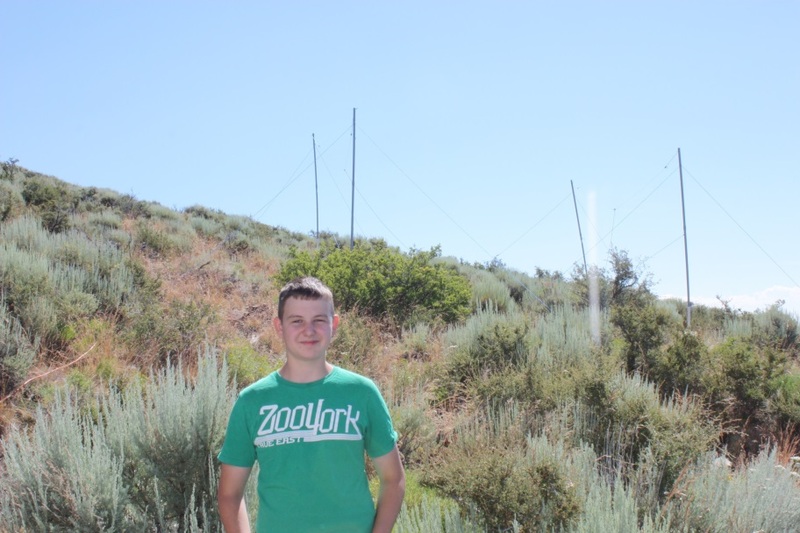 Participants in the Radio Astronomy Observing Program can win Bronze, Silver, or Gold level certificates based on their observations in certain categories. To win the Silver or Gold level awards you must be a member of the Astronomical League. Observers are expected to be actively involved in making the observations, observing streaming data from a remote observatory does not qualify for an award. Figure 1: Twin peak solar burst captured by Dave Cohen September 8, 2014 using an RTL dongle receiver and RTL Bridge software. I have yet to see Jupiter on one of these receivers as I am currently located in a very noisy environment. However, Dave Cohen has caught a solar flare using a dongle and RSS ( Figure 1) and I hope to see a Jupiter spectrum from one of our Radio Jove participants very soon. There are several pieces to this project, hardware and software. I advise it for people who already have a working Jove observatory and are not just starting out. We don't know how well this works yet, if at all, so please follow the path well-traveled if you are just beginning, and save this project as a reward for overcoming the hurdles ahead. 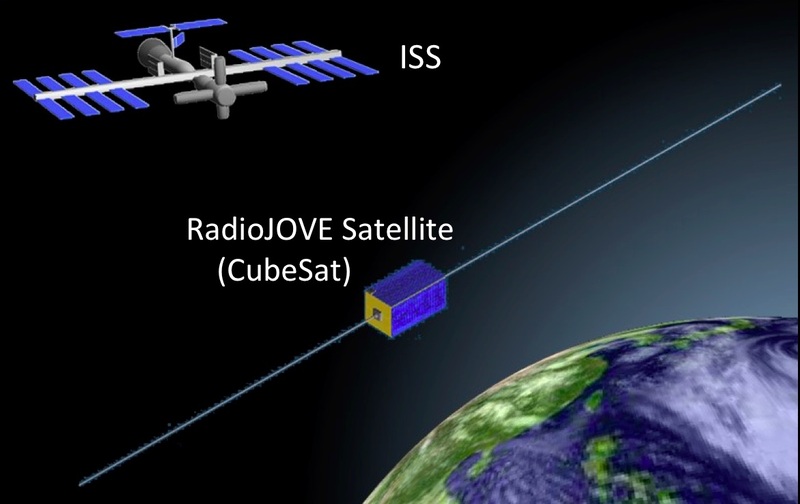 The RadioJove CubeSat will test space-based VLBI with a small satellite. I am the principal investigator of an educational project to increase access by young people to space resources. This program will run for three years and was just accepted by the Japanese Ministry of Education. The project includes the development by our college students of two small satellites (CubeSats). One of the satellites will be the RadioJOVE satellite for fundamental testing of space-based Jupiter radio VLBI (Very Long Baseline Interferometry). I hope this program will contribute to the RadioJOVE project. In this issue we present a few new additions to our album of Radio Jove dipoles. 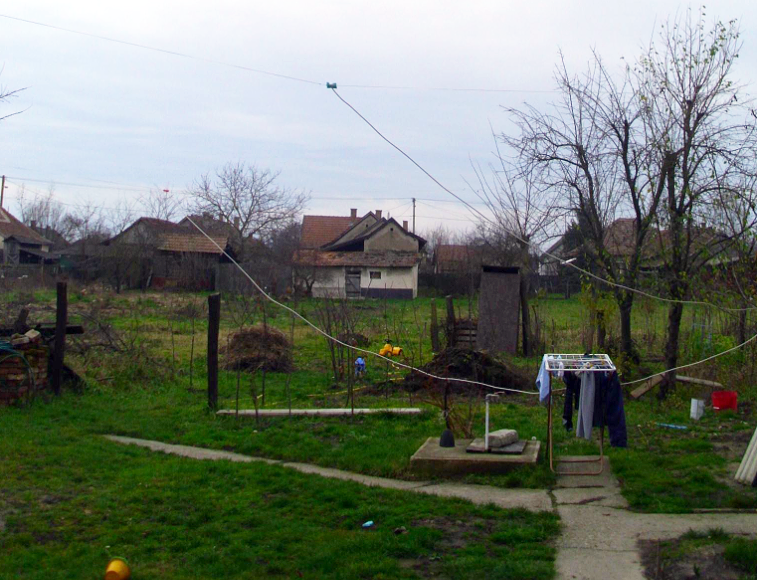 Along with the Radio Jove dipole sighting in Bend, Oregon (article 1), Ferenc Puskas sends us a photo of his Radio Jove installation in Hungary. Terry Schmidt has his Radio Jove system set up in northern Minnesota.